How I discovered the scary truth about Cambodia’s orphanage tourism and how volunteers could be hurting the very children they want to help. A ChildSafe campaign, in collaboration with Friends International and sponsored by UNICEF. Did you know that 77% of children in Cambodian orphanages are not actually orphans? A few months ago I didn’t either. Fortunately I came across this campaign which provided a much needed reality check. My name is Jemma and I am a communications volunteer at UNICEF Cambodia. Like many other travellers, I was considering donating my time and money to volunteer in one of the country’s hundreds of orphanages. I was imagining consoling crying babies, reading story books to cute toddlers and playing soccer with the older kids. Would I go into a centre that cares for children (like a preschool or kids hospital) and look at the kids like they’re zoo animals, taking ‘selfies’ to post on social media? Should I be able to pay a small fee and take a child, unsupervised, out on a ‘play date’ for the day? Is it fair to build relationships with these children for just a few days or weeks, only to then leave, forcing the already emotionally deprived child to feel alone and dejected? Should I be allowed to work with children without any employment, character or police check? I could not answer yes to any of these questions, it’s against the law in my country and morally absurd; they’re children, not toys. So why is it okay here in Cambodia? The UNICEF report found that 3 out of 4 children living in Cambodian orphanages are not actually orphans, they have at least one living parent. So why are they in an orphanage in the first place? In recent years the number of tourists to Cambodia has increased drastically. Many of these tourists want to visit orphanages, and coincidently the number of ‘orphans’ in Cambodia has also risen - doubled in the last five years in fact. 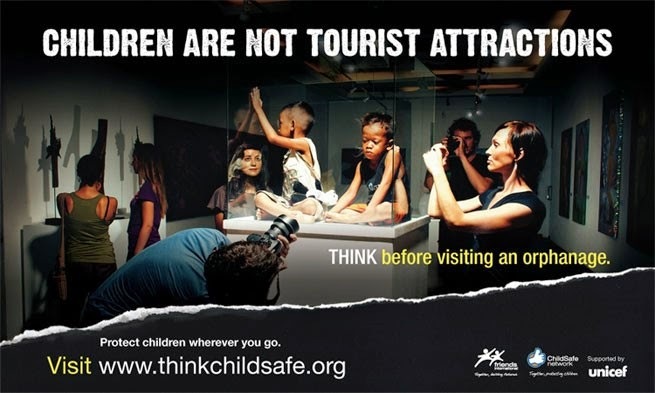 In a poor country using children as tourist attractions is a way to make money. Government policy here says that children should be kept in their family homes if possible, but it’s a struggle to enforce this message to a poor single mother living in a village trying to support eight children. This is how these facilities exploit victims of poverty in this country – convincing parents to hand over their children, with the promise of an education and a better life. During the recruitment process families will often get paid a fee for their child, and in the worst cases children are trafficked into the facilities. Many orphanages here are set up to run like a business, a business which uses children as the product – even sending them to dance for donations in popular tourist areas. Most of the orphanages are not run by the government, but by private individuals, churches or NGOs that are funded by overseas donors. Most of the foreign donors hand over their money with the intention to do something good, but often don’t realise what their money is actually funding. Other donors still think that orphanages are good for children. There is a government registration process and minimum standards and requirements related to residential care, but these aren’t strictly enforced and many facilities fly under the radar. This has resulted in anyone being able set up an orphanage here. You don’t even have to have experience in the child care industry, and staff and volunteers generally don’t have background checks before working with the children. Improvements have been made and some underperforming orphanages have been closed down over the past 2 years, but the process is slow. Sending children to live in orphanages should be a last resort. Evidence shows that the brains of children who grow up in orphanages do not develop properly, this happens because they often don’t have enough emotional and physical attention. Scarily, parts of their brain actually die, and the impact is irreversible. Also the lack of regulation in some orphanages puts the children at risk in many ways: exploitation, malnourishment, lack of education and sexual abuse. This video documents paedophiles who’ve set up orphanages here. It’s both shocking and sickening. Although it’s lovely for the children to have interaction and emotional support from other people, when I was searching for somewhere to volunteer, I found that the more reputable centres actually discouraged volunteering – stating that the children at their center were not there to entertain visiting westerners. When volunteers only stay for a short period of time it can be very detrimental for the child. Imagine being taken from your family, surrounded by people you don’t know, then receiving comfort from someone who will then leave you one month later. It would be traumatic and research shows the constant turnover of caregivers can harm a child’s development. It’s more important to have permanent long term, trained staff members who can support the children as they grow. So, where can you volunteer? It’s not all bad news, there are things you can do to make a difference. Remember however, that it’s not about you, it’s about the children. Everything should be done in their best interests. To best support the children of Cambodia, only volunteer with or donate to an organisation that helps families stay together. A family environment is the best place for a child to grow to their full potential. Thank you for your great article! I totally agree with and now that I see the whole picture, I will find some other way to help the kids. Thank you, we're glad you enjoyed it. It is a very important issue to talk about. Cambodia: a better education for every child?